(C. L. Koch, 1872) (Euscorpiidae) in Italy. I just recently learned about this article, but better late than never. After Fet et al. (2003), Euscorpius sicanus (C. L. Koch, 1837) was considered a highly polymorphic species, widespread in Italy, North Africa, Malta and Greece, having the characters eb = 5 + eba = 45. In this study, a neotype is designated for E. sicanus. The following forms, synonymized with E. sicanus by Fet et al. (2003), are herein revalidated and elevated to species status: E. calabriae Di Caporiacco, 1950 stat. n.; E. canestrinii (Fanzago, 1872) stat. n.; E. garganicus Di Caporiacco, 1950 stat. n. The latter species is herein recorded for the first time in the Italian regions of Molise and Campania, and in Pelagosa Island, Croatia. Two new species and one new subspecies are described, E. salentinus sp. n. from southern Apulia, E. altadonnai sp. 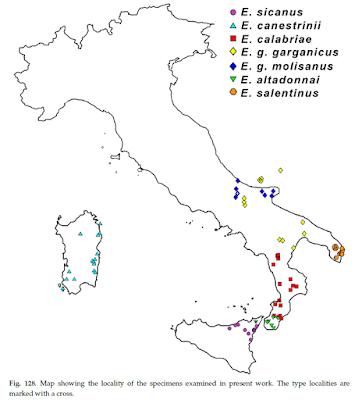 n. from northeastern Sicily and southern Calabria, and E. garganicus molisanus subsp. n. from northeastern Apulia, Molise and southeastern Abruzzo. 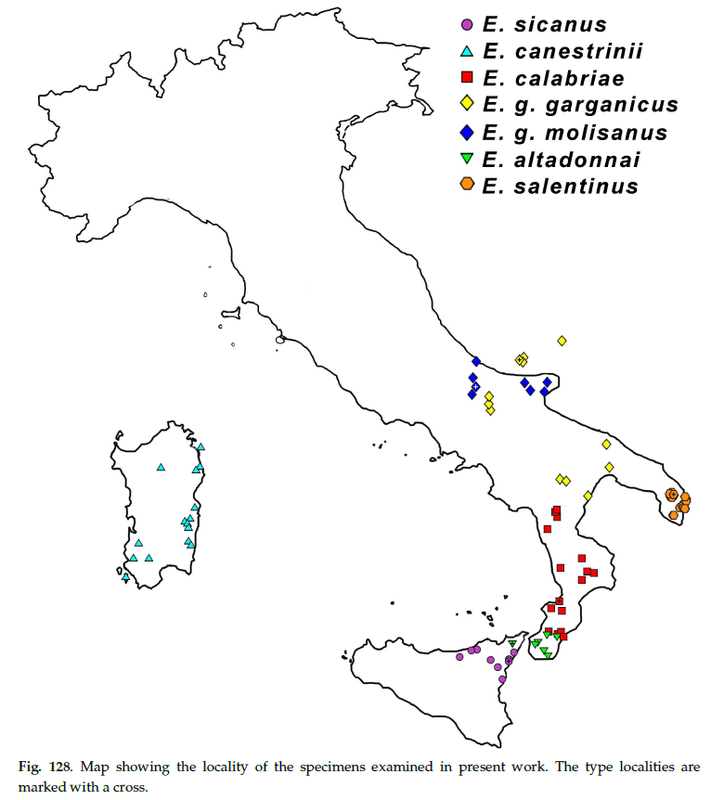 With these taxonomic changes the number of species in Italy has increased to 18.
complex in Italy (Scorpiones: Euscorpiidae). Arachnida - Rivista Aracnologica Italiana. 2017;3(11):2-60. Thanks to Gioele Tropea for sending me his interesting article! Vorherige News Zunehmende Löschung von „exotischen” Kleinanzeigen?